No one ever said birding is easy. With 10,000 birds in the world, one inevitably encounters groups of birds that are difficult to distinguish. Hummingbirds in the New World tropics, sandpipers and sparrows are great examples. It’s easy to identify a bird as a hummingbird but which of the 340 species are you seeing? Gulls are another group of challenging birds. Any school kid can identify a seagull but identifying the species can be perplexing. Which of the 16 gull species in Maine are we looking at? The difficulty of gull identification stems in part from the similarity of the different gull species. Although body mass differs among species, every gull has roughly the same silhouette. In addition, gulls pass through a bewildering series of plumages. Gulls molt all of their body feathers every fall, transforming their appearance dramatically. In the spring, gulls have a partial molt, again altering their appearance. To confound matters further, the timing of the molts differs among individuals so birds that are the same age may look strikingly different. Finally, gulls may take up to four years to acquire their adult plumage, called the definitive plumage in ornithology-speak. Smaller gulls like Bonaparte’s Gull require only two years to get to their definitive plumage while our larger gulls like Herring Gull and Great Black-backed Gull take four years to reach adulthood. That’s a lot of plumages to keep track of. To be sure, there are some birders who delight in the challenges of gull identification. Poring through flocks of hundreds of gulls to find an uncommon gull like a Lesser Black-backed Gull, Black-headed Gull, Little Gull or Sabine’s Gull is a joy to gull enthusiasts. That level of skill is tough to come by. However, a recent book from Princeton University Press may be a gateway to allow you to acquire those skills. The book is called Gulls Simplified by Pete Dunne and Kevin Karlson. Yes, I am aware that the phrase gulls simplified is a contradiction in terms but the phrase fits this book. Who knows? Maybe your improved gull identification skills will allow you to be the person who finds a Slaty-billed Gull among the hundreds of gulls at the Hatch Hill Dump in Augusta or some other gull haven! Dunne and Karlson are both highly skilled birders and popular bird tour leaders. However, neither one has a particular passion for gulls. The authors argue their level of interest is perfect for a book that aims to fill a need for a gull identification guide that is welcoming to any birder. The authors rightly claim that most birders don’t really care whether the Herring Gull they are looking at is one, two or three years old. It is more important to know that it is a Herring Gull. Dunne notes that is easier for him to identify a Lesser Black-billed Gull at 200 feet than at 20 feet because he uses general impressions rather than plumage details. Dunn and Karlson are pioneers in promoting bird identification by impression, having produced identification guides for hawks and shorebirds that use this technique effectively. The approach works for gulls, too. The book is packed with excellent color photographs, mostly taken by Karlson. Detailed legends for each photograph describe important characteristics useful in identification. I counted 46 photos for the Herring Gull. There are several photo quizzes, as well, to test your enhanced identification skills. The guide covers the 20 regularly occurring gull species in North America as well as five rare gulls. A section with photos on hybrids is illuminating. 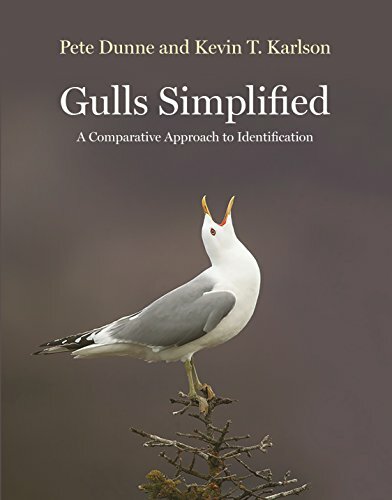 “Gulls Simplified” is a great addition to the wealth of bird guides we have. This column is the first of three reviewing the highlights of some of Maine Christmas Bird Counts. This count season spanned December 15 through January 5. The Greater Portland count was held on December 15. The count yielded 102 species. The highlight of the count was Great Black Hawk, still present on count day in the Deering Oaks Park area in downtown Portland. This record represents not only a first for the count and for Maine CBCs but for the United States! Nineteen species of waterfowl were found. Uncommon ducks for this time of year included a Wood Duck, an American Wigeon, six Gadwall, three Northern Pintail and a Barrow’s Goldeneye. Sixty-three Horned Grebes and 36 Red-necked Grebes were normal counts. Both of our expected loons were present: five Red-throated Loons and 224 Common Loons. Shorebirds included a single Killdeer, a single Sanderling and 57 Purple Sandpipers. A single Dovekie and 32 Razorbills along with 15 Black Guillemots made for a nice alcid count. Lingering breeding birds are always of interest. This year’s count produced a rich diversity of such hardy (or foolhardy!) birds: 10 Great Blue Herons, a Turkey Vulture, four Northern Harriers, a Red-shouldered Hawk, 10 Belted Kingfishers, 10 Northern Flickers, three Winter Wrens, 19 Hermit Thrushes, 10 Gray Catbirds, two Brown Thrashers, four Savannah Sparrows, a Lincoln’s Sparrow, three Swamp Sparrows, a Baltimore Oriole and five Red-winged Blackbirds. Amazing! Northern finches were mostly absent with a Pine Grosbeak and 15 Pine Siskins present. Bohemian Waxwings and Snow Buntings, present in other parts of the state, were no-shows. The Augusta Count was also held on December 15, yielding 52 species. Still and moving water was mostly frozen so the modest waterfowl count was expected. Six species were found with Mallards (152) being the most common. The expected winter gulls (Ring-billed Gull, Herring Gull, Great Black-backed Gull) were joined by one Lesser Black-backed Gull and one Iceland Gull. A lone Northern Shrike was a nice sighting of this erratic winter visitor. A whopping 308 Bohemian Waxwings were tallied for an excellent early winter total. Their cousin, the Cedar Waxwing, was represented by 38 individuals. Irruptive finches were sparse with 11 Pine Grosbeaks and 13 Pine Siskins present. Lingering birds from the fall included three Belted Kingfishers, 16 Eastern Bluebirds, a Chipping Sparrow and a Fox Sparrow. A single White-crowned Sparrow was a surprise; these birds don’t breed in Maine and usually pass through in migration by early November. The Unity CBC was also held on December 15, producing a list 47 species. With most water frozen, waterfowl were hard to find and only five species were tallied: five Canada Geese, 10 Mallards, four American Black Ducks, one Hooded Merganser and two Common Mergansers. A Glaucous Gull among the 503 Herring Gulls was a nice find. The Unity counters put in some nocturnal birding time and found a Great Horned Owl and four Barred Owls. Lingering migrants were absent, a striking contrast to the earlier counts in this column. Bohemian Waxwings were common with 184 showing off their beautiful plumage. In what will I think become a common refrain, northern finches were present but not in the numbers we saw in November. In Unity, 70 Pine Grosbeaks, five Pine Siskins and 17 Evening Grosbeaks were present. The Moose Island-Jonesport count was also conducted on December 15. That count produced a list of 65 species. Sixteen species of waterfowl included 21 Harlequin Ducks and a Barrow’s Goldeneye among the more common coastal ducks. A single Red-throated Loon was found. Alcids included a Thick-billed Murre and three Razorbills. A Snowy Owl was a treat. One Northern Shrike was found, no doubt terrorizing small songbirds and mammals. Three Belted Kingfishers were late for this area. Irruptive finches included 17 Purple Finches, 11 Red Crossbills and 6 Pine Siskins.